Have you ever wanted to have conditional property setting possibilities in your custom web parts? I have. The scenario has been that I would have wanted to render a control to web part property setting based on some other property selection – i.e. if user selects something from web part’s properties, something else would emerge to be selected from or filled in. When developing over SharePoint 2007 I had an idea how to do it with Ajax but never had the time to make it happen as in SharePoint 2007 you wouldn’t have ASP.NET 3.5 and Ajax web server extensions available in your web application by default. 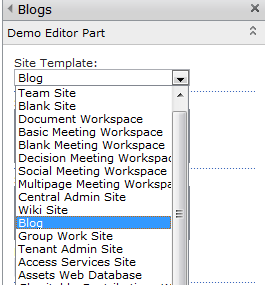 In SharePoint 2010 you don’t have that limitation any more so I gave my thought a go and below is a sample what I came up with – a web part with one drop down list, two multi selectable list boxes and one text field in the web part’s editor part. Web template is chosen from the drop down list. The first list box makes all site collection’s root webs of a web application available to be selected from and the other makes a list of sites published with a selected web template. The text box contains an integer value. 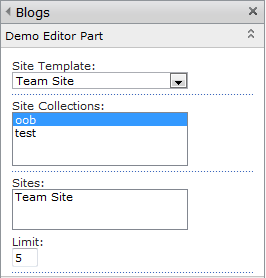 Title = "Demo Editor Part"
// where SPWeb WebTemplate contains only the "TEMPLATE"
Web Template is available to be selected from. Sites under the selected site collections published with the selected web template are available to be selected from. Other sites created with the selected web template are also available to be selected from. Excellent work, well done fella! thanks i am working on something similar with two dropdownlist, where can i find to download the project for the above one? 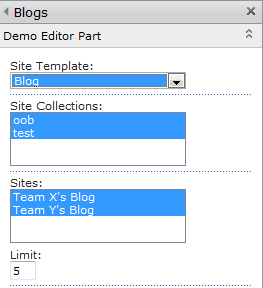 i started copying and pasting the code and run it and i able to see the custom editor part but when i change the Site Template the Site Collections listbox is not changing it just showing the 4 options i get and regardless what i select from the Site Template i still those 4 options…. looks like the AutoPost is not firing? Hi Abu, I can’t tell what could be wrong in your solution but if you try and debug it you might find the problem and see if the autopostback is firing. The screenshots above are created with the provided code samples and there you can see the autopostback working (the Site Collections and Sites ListBoxes are updated). But it has been a year and a half and I remember editing the post after first publishing it, so if you find something wrong with it, let me know. Do you have any suggestion for maintaining some sort of state in the EditorPart? For example, I am adding a LiteralControl and setting it’s text to some HTML markup. The markup is styled so that the jQueryUI Sortable plugin will run on it. I want to capture the new markup after hitting OK/Apply, but trying to get the Text property of the LiteralControl triggers CreateChildControls to run again which sets it to its old value. this…. Thank YOU for the meal!! But yeah, thanks for spending the time to discuss this topic here on your blog. Thanks for sharing. This gave me a very good impression!